This article is about Pozole, the soup. For the drink, see Pozol. Pozole (Nahuatl: pozolli po'solːi , variants: pozolé, pozolli, pasole), which means "hominy", is a traditional soup or stew from Mexico, which once had ritual significance. 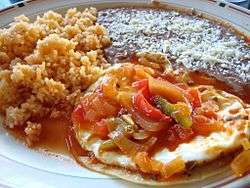 It is made from hominy, with meat (typically pork), and can be seasoned and garnished with shredded cabbage, chile peppers, onion, garlic, radishes, avocado, salsa and/or limes. Pozole is frequently served as a celebratory dish throughout Mexico and by Mexican communities outside Mexico. 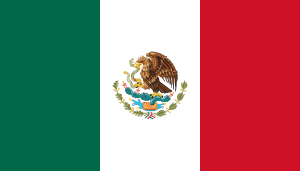 Common occasions include Mexico Independence Day, quince años, weddings, birthdays, baptisms, and New Year's Day. This drawing from page 22 of the Codex f Magliabechiano depicts pozole. Pozole was mentioned in Fray Bernardino de Sahagún's General History of the Things of New Spain (c. 1500). Since maize was a sacred plant for the Aztecs and other inhabitants of Mesoamerica, pozole was made to be consumed on special occasions. 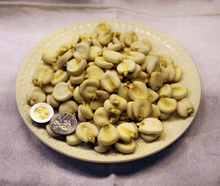 The conjunction of maize (usually whole hominy kernels) and meat in a single dish is of particular interest to scholars, because the ancient Americans(which?) believed the gods made humans out of masa (cornmeal dough). According to research by the Instituto Nacional de Antropología e Historia (National Institute of Anthropology and History) and the Universidad Nacional Autónoma de México, on these special occasions, the meat used in the pozole was human. After the prisoners were killed by having their hearts torn out in a ritual sacrifice, the rest of the body was chopped and cooked with maize, and the resulting meal was shared among the whole community as an act of religious communion. After the Conquest, when cannibalism was banned, pork became the staple meat as it "tasted very similar" [to human flesh], according to a Spanish priest. Wikimedia Commons has media related to Pozole. 1 2 Clark, Melissa (17 February 2010). "Save the Pig's Head for Later". New York Times. Retrieved 13 May 2010. ↑ Campbell, Cathie. "Stir Crazy: It's not too late for nice, hot soup". Madera Tribune. Retrieved 15 May 2010. ↑ "Pasole And Green Chili Stew Recipe - Food.com". Retrieved 2016-10-19. ↑ Duggan, Tara (27 December 2009). "Pozole: Streamlined and budget friendly". San Francisco Chronicle. Retrieved 15 May 2010. 1 2 "Los mexicanos prehispánicos comían pozole con carne humana – La Crónica de Hoy / Lunes 13 de Dic., 2010". Cronica.com.mx. Retrieved 13 December 2010.
de Sahagún, Bernardino (2008). Historia de las Cosas de la Nueva España. Barcelona: Linkgua. ISBN 84-9816-849-X. .